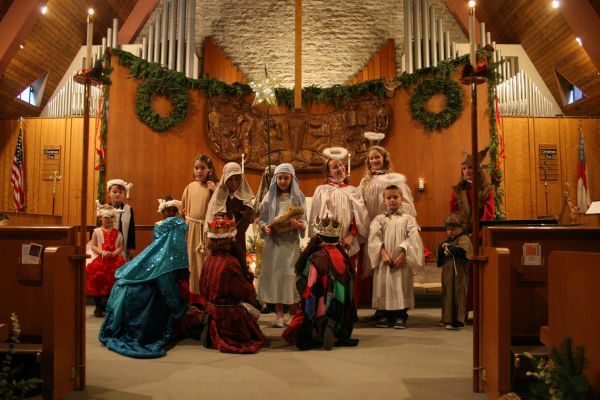 It's time to sign-up for this year's Christmas Pageant! Children of all ages are encouraged to be a part of this fun Grace tradition! Older children read the Christmas story while younger children create the Christmas tableau. We will have only one rehearsal on Sunday, Dec. 17 immediately following our 10 a.m. service. The pageant takes place at our 4 p.m. Christmas Eve service. It's always a packed house as families and friends come to see the children perform and welcome the newborn King! Grace member Jennifer Sisul is directing this year's extravaganza. Additional parents are also needed to help with costumes and general sheep wrangling. Please sign up in Albright Parish Hall if your child would like to be involved -- we have spots for readers and non-readers. Contact Janis Greenbaum in the church office for more information.